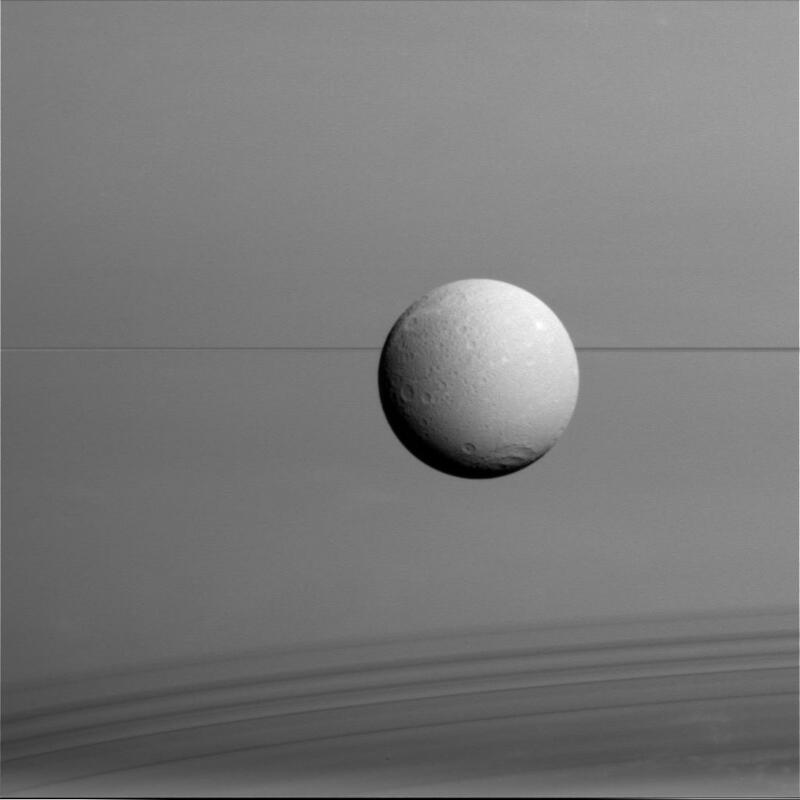 NASA’s venerable Cassini spacecraft may still have another two years left in its exploration of the Saturn system but on Monday, August 17, it had its final intimate visit with Dione, one of Saturn’s largest natural satellites at nearly 700 miles (1,126 km) across. 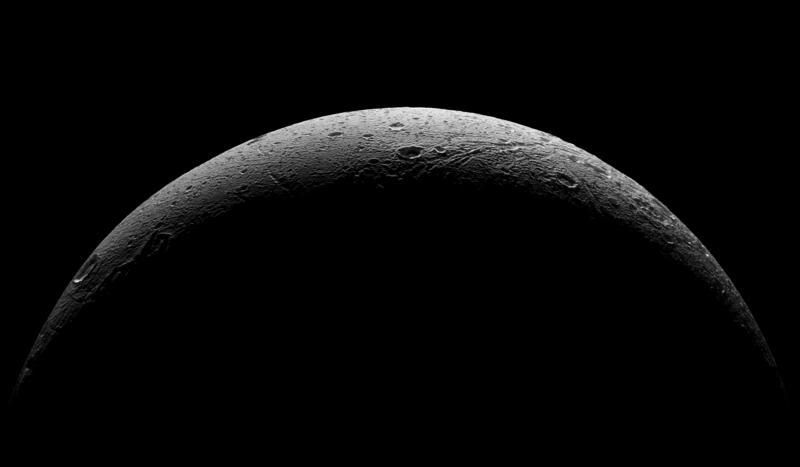 On that day Cassini passed within 300 miles (480 km) of Dione at 2:33 p.m. EDT (18:33 UTC), not its closest flyby ever but certainly near enough to get some truly spectacular views of the icy moon’s ancient and cratered surface. 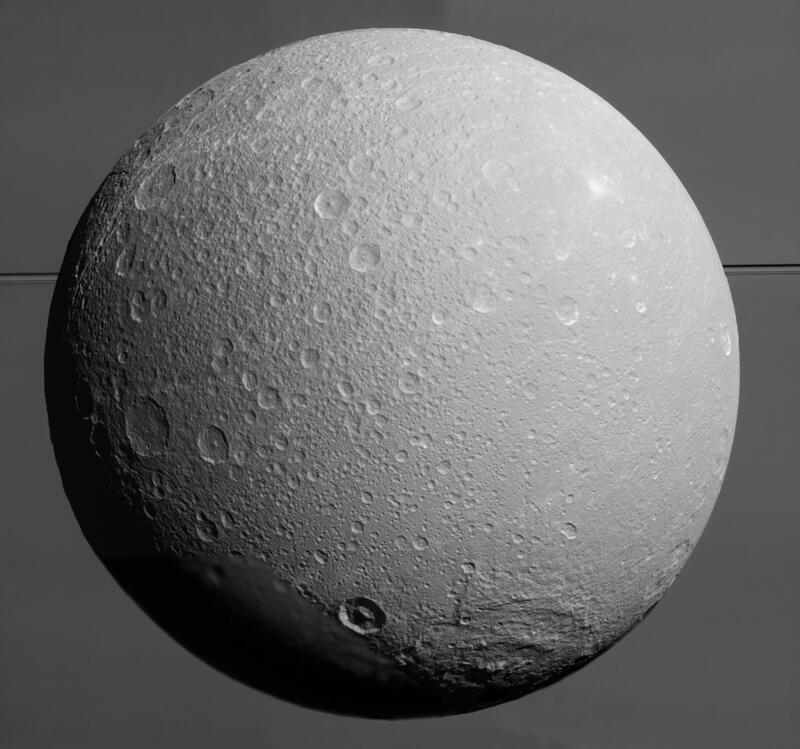 Dione imaged from a distance of 45,000 miles (73,000 km) on Aug. 17, 2015. Saturn fills the background, its edge-on rings cutting a thin dark line across the center with their shadows falling across the planet’s clouds at bottom. 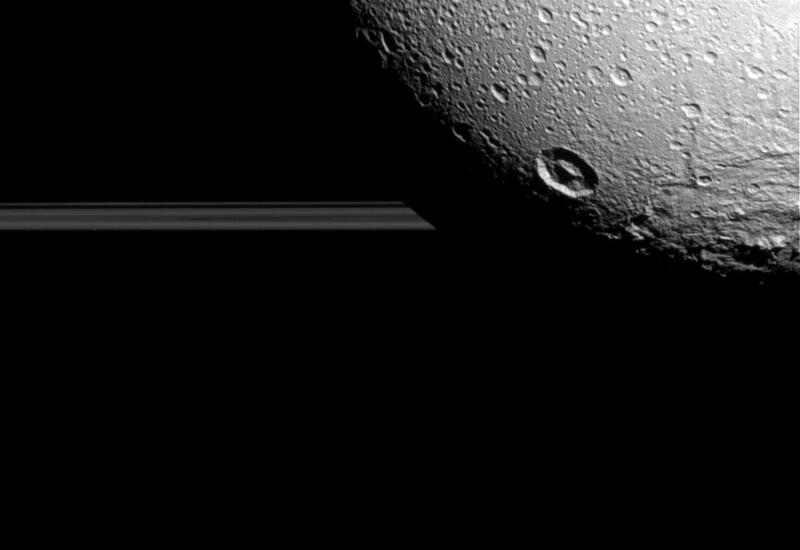 Dione’s night side blocks the view of Saturn’s rings, seen edge-on as Cassini approached the moon on Aug. 17, 2015. 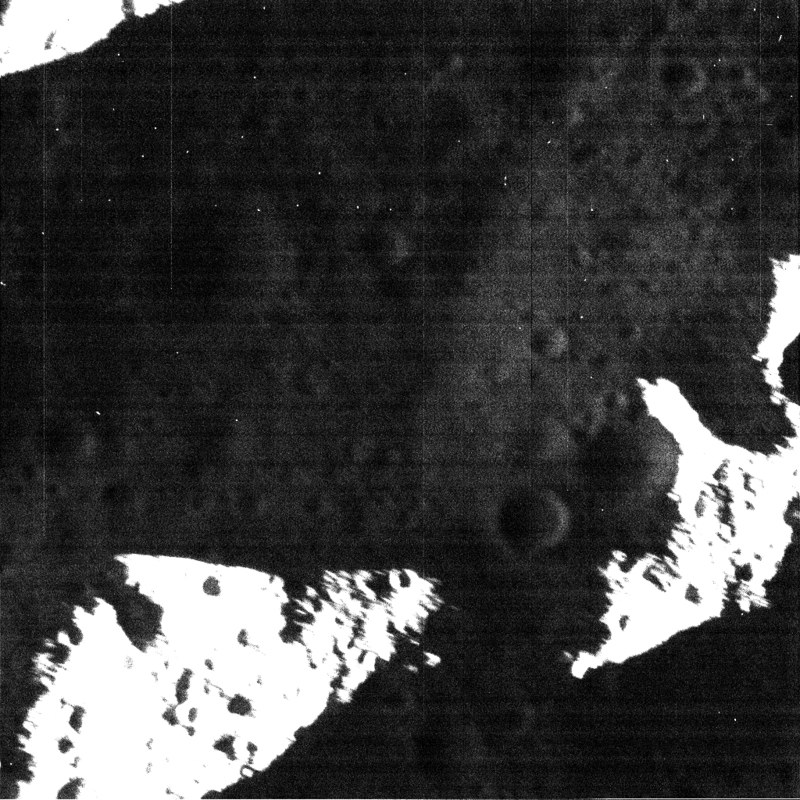 A wide-angle camera image of Dione’s surface acquired during closest approach. 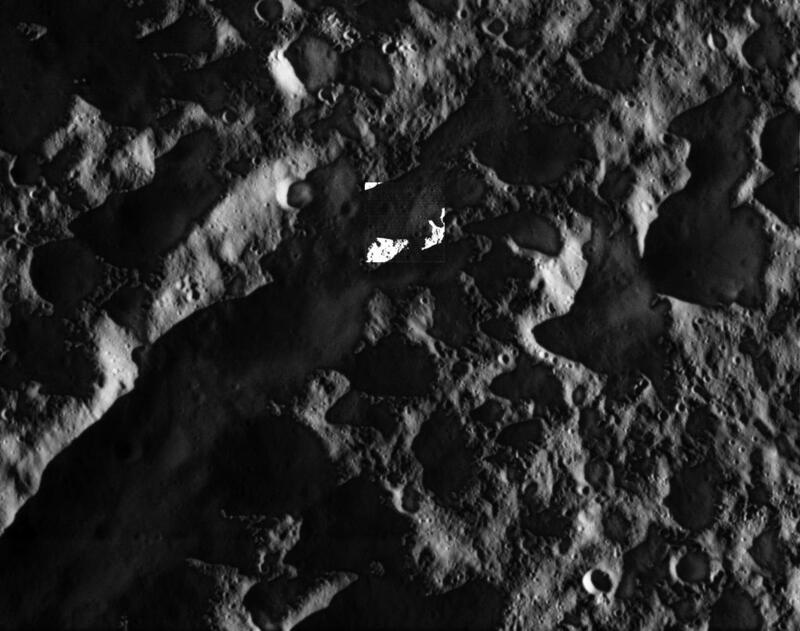 The area at center was also imaged by the narrow-angle camera, and is one of the highest-resolution views of Dione’s surface ever obtained. 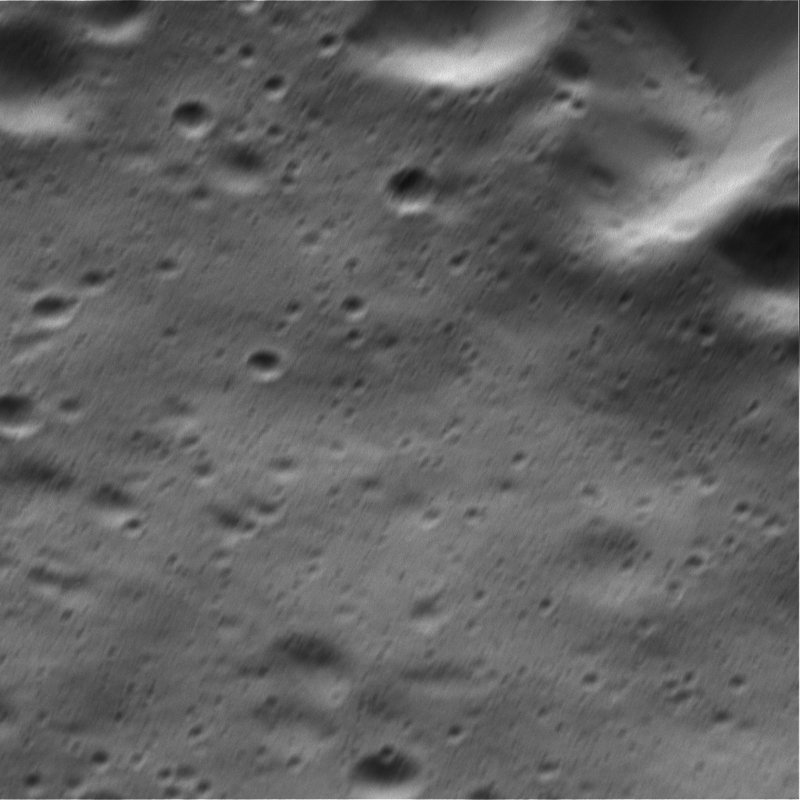 Cassini narrow-angle camera (NAC) view of Dione’s surface (see previous image for context). Illumination is enhanced by reflected sunlight off Saturn. At 3 meters per pixel this NAC image, acquired Aug. 17, is the highest-resolution view of Dione’s surface ever obtained. Cassini’s parting view of Dione’s crescent, made from five images acquired from 37,000 miles (59,000 km) to 47,000 miles (75,000 km) away on Aug. 17, 2015. Launched Oct. 15, 1997, Cassini arrived in orbit at Saturn on June 30, 2004. It has spent the last eleven-plus years intimately exploring Saturn, its rings, and its family of moons, revealing information only possible through a long-term mission over multiple seasons (and multiple mission extensions!) On September 15, 2017 Cassini will perform its last and most dramatic “Grand Finale” maneuver, traveling between Saturn’s rings and down into the atmosphere of the planet itself. Until then we will steadily be seeing more of Cassini’s “lasts”…hopefully they’ll all yield as beautiful results as this one did! Learn more about the Cassini mission here and see a collection of images acquired from the spacecraft here. 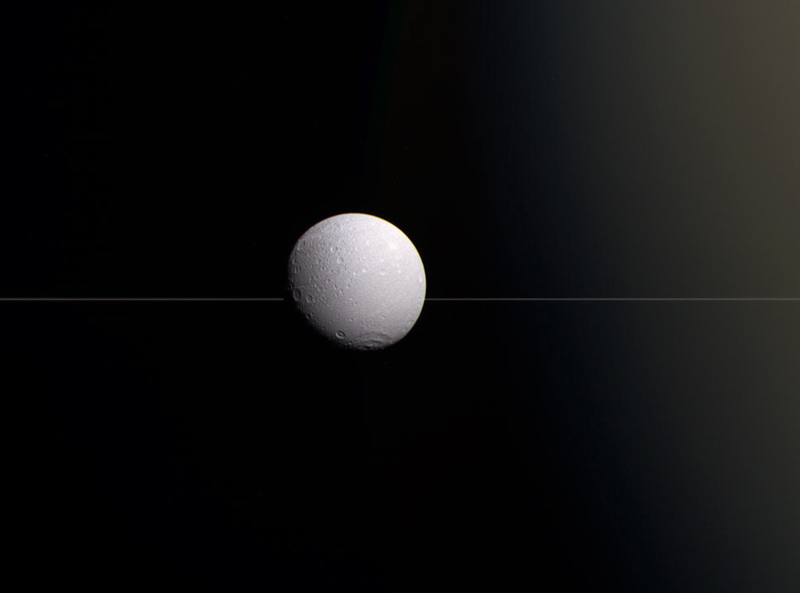 Color-composite of Dione from Aug. 17, 2015. NASA/JPL-Caltech/Jason Major. It was a nice place to visit but I wouldn’t want to live there. Me neither. Internet is too slow.